Take part in amazing time-travelling experience in Midnight Paris! What can be more romantic than excursion in Paris? Excursion by steps of heroes from film by Woody Allen! During the tour you will see well-known and still very charming sightseens of Paris: The Rodin museum, Louvre, the Eiffel Tower. Take start of the tour in front of the hotel Le Bristol, one of the best hotels in Paris, which opened it`s doors in 1925 and where the main heroes of the film stayed.Then walking along the bridge of Alexander III you will find yourself near Rodin museum, which is considered to be one of the most visited museum in Paris. In it`s beautiful park you can take a look to a famous sculpture of Ogust Rodin "Thinker" and other works. After taking a look to well-known sightseens of Paris, let`s try to repeat the time travel experience of Gil, the main charachter of the film: get lost in the streets of the city and find yourself near the Church of Saint-Etienne du Mond. 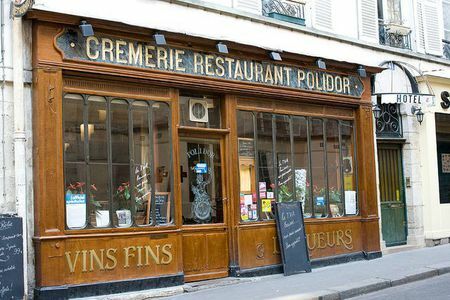 And near the Church is located the famous restaurant Le Polidor where Gil met Ernest Hemingway.